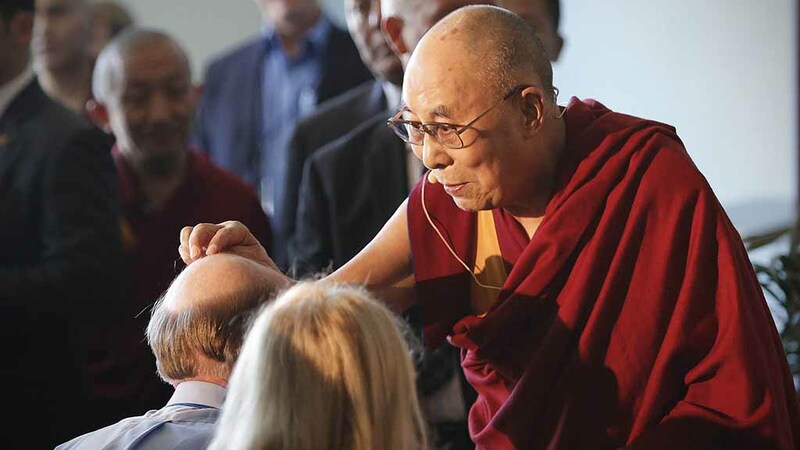 When I received a playful touch to my bald spot from the 14th Dalai Lama, I wasn’t quite as irreverent. 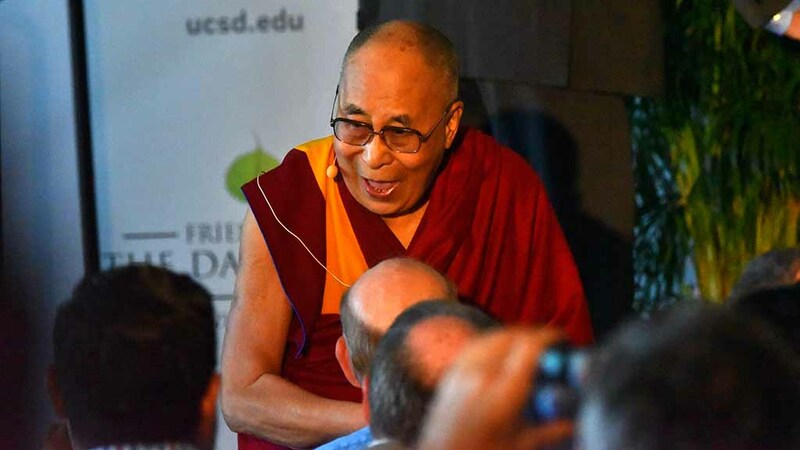 At 9:10 a.m. Friday, I became a minor subject of media interest when the Nobel Peace Prize winner spotted my similar male-pattern baldness as he entered a UC San Diego press conference. Having seen him shake hands with other reporters in the front row, I was ready for a hearty grasp. Instead, his right index finger hovered over my head. “If you give me permission, may I touch here?” he said. “Yes,” I said — as if I had a choice. The mischievous monk traced a circle and otherwise swirled my scalp. It lasted 3 seconds. It was a surprise, but no shock. I was well aware of the 81-year-old’s merry prankster persona. How he lived his joyful social-animal creed. But my first thought was: Well, now I have to take questions on this. I wasn’t mobbed, thank goodness. Don Harrison taped my reflections as his grandson, Shor Masori, took pictures for a story in San Diego Jewish World. Several former Union-Tribune colleagues asked me to describe the finger action for sake of photo captions. And Channel 10 News and NBC San Diego aired clips of my hairless spot. A photographer friend asked me if I’d ever wash my head again (and told me a story about a similar incident involving Harry Truman and his grandmother). I was lucky to have my own story to tell. At least I was presentable. First, I had gotten a haircut just 25 hours earlier. Second, my wife and I rose at 4:45 a.m. at our La Mesa home to arrive at UC San Diego about 6:15 — fearing that an expected 110 credentialed media would be jockeying for seats. Fewer than 50 showed, though, at the RIMAC Activity Room overlooking the ballfields where 25,000 were ticketed to hear His Holiness at 10 a.m. So grabbing a seat close to the monk was a slam dunk. Afterward, I felt more melancholy than jolly. 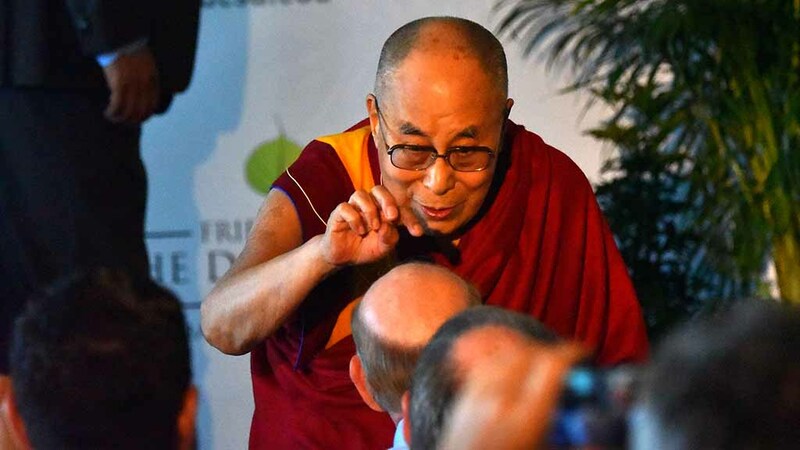 My late brother Loren — a doctor of Traditional Chinese Medicine known as Al Stone — would have been over the moon about my Dalai Lama moment. Loren, who studied for seven months in southern China, had adopted a Buddhist lifestyle in his rent-controlled Santa Monica flat. No shoes indoors. Incense, candles and meditation. He was a regular at the Sunday drum circle at Venice Beach. I inherited his small ceremonial gong. What would he have said? I didn’t dwell on the lost wisdom. I didn’t get a chance to ask my Comic-Con question: Who’s your favorite superhero or cartoon character? I wouldn’t have been surprised if he’d said The Joker.